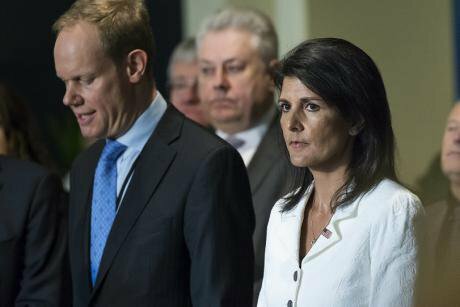 Trump's envoy Nikki Haley (right), and UK ambassador to the UN Matthew Rycroft. PA/Albin Lohr-Jones. All Rights Reserved.Ground-breaking talks at the United Nations – negotiating a treaty to ban nuclear weapons – got off to a strong start on 27 March, chaired by Ambassador Elayne Whyte of Costa Rica. The opening session in the General Assembly included statements from Pope Francis and Peter Maurer, head of the International Committee of the Red Cross. Emphasising the talks’ historic significance, Maurer appealed to delegates “in the name of humanity... to adopt a clear and unambiguous prohibition of nuclear weapons, grounded in international humanitarian law." The first of several hibakusha (the term coined in Japan for nuclear bomb victims) to speak was Toshiki Fujimori, who had been a child in Hiroshima when the first atomic bomb was detonated on 6 August 1945. It flattened the city and killed 140,000 people instantly. By the end of that year, the death toll had reached 210,000, including members of his own family. Fujimori described feeling "heartbroken" when the Japanese government voted against last year's multilateral nuclear disarmament resolution. He also shared news of the hibakusha-initiated campaign that has collected more than 1.7 million signatures urging governments to ban these inhumane weapons of mass destruction once and for all. As delegates began debating what precisely the treaty should cover, some basic, shared aims came to the fore: to strengthen existing international law and achieve an unequivocal prohibition on the use, deployment, development and possession of nuclear weapons, with clear obligations to eliminate all nuclear arsenals. But some wanted to go further than others and there are some difficult devils in the detail that will need to be resolved. The most challenging questions so far include: the relationship between the new treaty and earlier agreements such as the 1968 Non-Proliferation Treaty (NPT) and 1996 Comprehensive Test Ban Treaty (CTBT); whether to be explicit about banning not just the use but also threats to use nuclear weapons, which are currently the basis for nuclear deterrence doctrines; and how to address actions that induce or assist states to violate the treaty, such as financing nuclear weapons production and facilitating their deployment. A majority of those involved see the nuclear ban treaty as the next viable step in a disarmament process that began 70 years ago, and which needs to enact clear and necessary prohibitions and obligations under international law. They want to avoid the fate of treaty efforts in recent decades that were blocked or lost in procedures and technicalities. So, they argue, tasks like verification or timetables to eliminate existing stockpiles will be more effectively addressed in subsequent talks. Inevitably, there were a few who wanted a different kind of legal instrument – seeking either to accomplish everything in one long negotiating process or to provide loopholes to let certain nuclear-armed states or military alliances off the disarmament hook. While delegates gathered at the United Nations on the first morning, Donald Trump’s UN ambassador Nikki Haley led a small cluster of nuclear allies in a protest against the negotiations. Describing herself as a "mom, wife and daughter", Haley stated "there is nothing I want more for my family than a world without nuclear weapons” – before arguing that the US must keep its nuclear arsenal. 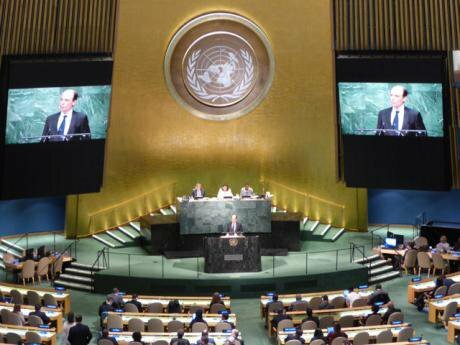 Britain's ambassador Matthew Rycroft stood by her, explaining that the UK government decided to join the boycott because "we do not believe that [the UN] negotiations will lead to effective progress on global nuclear disarmament." As diplomats from over 130 states – two-thirds of the UN's membership – walked past her to participate in the negotiations, Haley dismissed them, saying: "When you see those walking into the General Assembly to create a nuclear weapons ban, you have to ask yourself, are they looking out for their people? Do they really understand the threats that we have?" Had the US not chosen to boycott the talks, Haley would have heard Austria's Vice Minister Alexander Marschik's answers to her questions. He recalled that expert analyses and evidence considered by the December 2014 Vienna Conference showed with "stunning clarity" that the risks, accidents, mistakes, radiation and climate impacts – and the local, regional and global humanitarian consequences of nuclear weapons – have been hugely underestimated. Concluding that the existential threats that nuclear weapons pose to humanity far outweigh any possible advantages, Marschik emphasised: "We came away [from the Vienna Conference] with the certainty that we must reduce that risk and that the only way... was the prohibition of such weapons through a legally binding instrument." The Austrian diplomat acknowledged concerns raised by nuclear-armed states, explaining that no individual country would be asked to disarm by themselves: “What we seek is a general legal prohibition and once we have that, then will we establish... a system of eliminating [these weapons] together." Marschik also questioned: "Is doing nothing a better strategy? …Waiting for disaster is no strategy." Appealing to negotiators not to overload the current process and “miss this opportunity,” he called for unity and focus behind “one, narrow, clear objective: a legal prohibition of nuclear weapons… we will only succeed if we are disciplined, if we put the common goal ahead of [any] national agenda." Haley, Trump’s ambassador, didn't mention US nuclear accidents or miscalculations in her media interventions. Instead, she justified boycotting the UN negotiations because of "bad actors" – mentioning North Korea (which withdrew from the NPT in 2003 and is trying to develop nuclear weapons), and Iran (which is party to the NPT). North Korea had voted in favour of the 2016 resolution initiating the nuclear treaty negotiations – perhaps in recognition that this might be better for its security than its provocative testing and parading of nuclear warheads and missiles. But wiser heads did not prevail, and Kim Jong-un joined Trump, Putin and much of NATO in boycotting the talks. Undoubtedly, Iran has caused decades of international concern by pursuing an ambitious programme of "civilian" uranium enrichment under the NPT. In 2015, Iran accepted substantial additional inspections under a Joint Comprehensive Plan of Action (JCPOA) brokered by the US, Russia, China, France, Germany and the UK. This landmark non-proliferation agreement – which currently underpins efforts to constrain Iran's development of sensitive nuclear technologies – has recently been threatened by Trump who has talked about ditching it. Iran had followed the JCPOA agreement by voting in favour of the current treaty negotiations. While unsuccessful in its efforts to challenge the Chair's draft rules of procedure – apparently wishing to restrict civil society access and establish some form of consensus rule that would give participating states a veto – Iran has participated fully in the talks. It has made clear its desire for a comprehensive treaty that will "prohibit the possession, development, production, testing, transfer, deployment, modernization and use or threat of use of nuclear weapons, under any circumstances." Haley's media stunt seemed to backfire, as it was headlined an attempt to derail the talks, and provided a useful hook for interested media to cover the humanitarian case for prohibiting nuclear weapons put forward by International Campaign to Abolish Nuclear Weapons (ICAN), which coordinates over 400 pro-ban organisations in 100 countries. Several NATO countries – such as Norway, Canada, Germany, Belgium, Italy and Spain – appeared to be absent from the general assembly, although they did not publicly stand with the US protest. The Netherlands was present and argued that the treaty ought to be compatible with its obligations to NATO, which will “remain a nuclear alliance as long as nuclear weapons exist." The Dutch called for an explicit linkage with the NPT, which NATO states consider compatible with nuclear deterrence doctrines, the development and enhancement of nuclear arsenals, and the deployment of US nuclear bombs in European “non-nuclear weapon states,” including the Netherlands. The Dutch intervention can be read as an attempt to square the nuclear disarmament circle – or to derail the talks – by advocating the contradictory target of harmonising a nuclear prohibition treaty with NATO's nuclear sharing and use doctrines. However, the fact that this NATO member did not bow to heavy US, French and British pressure for a boycott must be counted a victory for parliamentary democracy. In the Netherlands, civil society raised awareness about humanitarian disarmament initiatives and worked closely with Dutch parliamentarians who voted to instruct their government to join the negotiations. Meanwhile, delegates representing Green Parties and parliamentarians from all over world gathered for the 2017 Global Greens Congress (30 March-2 April) in the British city of Liverpool, where an emergency resolution was unanimously adopted calling on "all governments to participate constructively in the negotiations until a strong nuclear ban treaty is concluded under international humanitarian law, and to facilitate its adoption, signature, and entry into force." Formally proposed by Ulrike Lunacek MEP, Austrian Vice President of the European Parliament, this resolution further urged that elected mayors and parliamentarians be included in “governmental delegations and represented when the UN negotiations resume... until they are effectively concluded." When the first week of UN talks closed on 31 March, Ambassador Whyte promised that a draft treaty text would be issued well before the resumption of negotiations (15 June). She also underscored the importance of finalising a strong and effective treaty by the time the talks are scheduled to end (7 July). For the next few weeks diplomatic attention will turn to the NPT, which will hold the first meeting of the 2020 review cycle in early May in Vienna. Five of the nuclear-armed states that boycotted the UN negotiations will attend, along with all NATO members, so it will be interesting to see if they are held to account over their failure to comply with the NPT's Article 6 obligation to pursue nuclear disarmament in good faith. ICAN partners are working closely with parliamentarians, mayors and local councillors to involve them in both treaty processes, highlighting how prohibiting nuclear weapons and non-proliferation will play a mutually reinforcing role in stigmatising nuclear weapons development, reducing dangers, and preventing catastrophic detonations and radiation poisoning caused by intentional use or accidents.